2. Select the position: "OFF" (deactivation), with "rear facing" child seat, "ON" (activation), with front passenger or "forwards facing" child seat. 3. Remove the key keeping the switch in the new position. A. 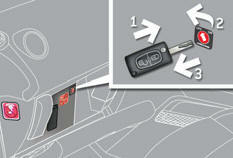 Front and/or rear seat belts not fastened / unfastened warning lamp. B. Front left seat belt warning lamp. C. Front right seat belt warning lamp. 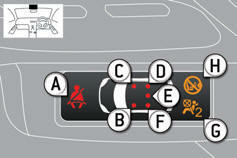 D. Rear right seat belt warning lamp. E. Rear centre seat belt warning lamp. F. Rear left seat belt warning lamp. G. Passenger's front airbag deactivated warning lamp. H. Passenger's front airbag activated warning lamp. 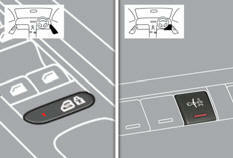 Illumination of the indicator lamp indicates the status of the corresponding function.